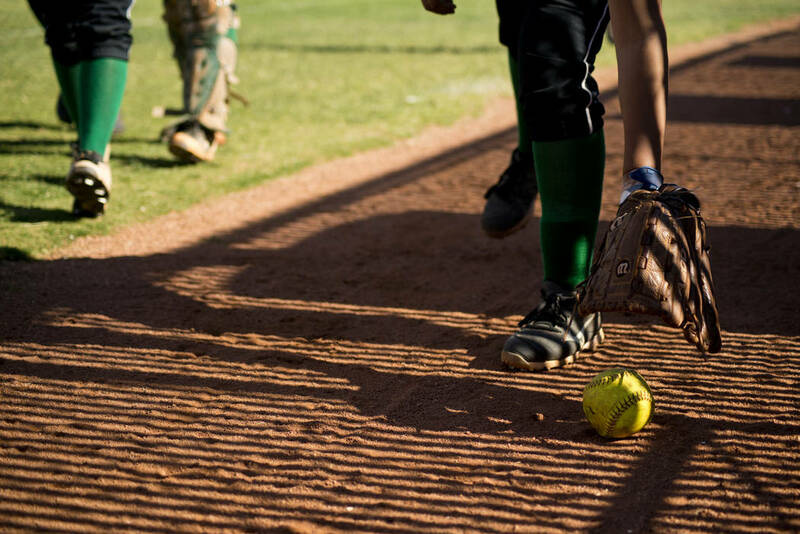 MacKenzie Perry scattered seven hits and struck out 14 in a complete-game effort Monday as Rancho’s softball team improved to 17-0 overall with an 11-1 win at Las Vegas High. MacKenzie Perry scattered seven hits and struck out 14 in a complete-game effort Monday as Rancho’s softball team posted an 11-1 win at Las Vegas High and improved to 17-0 overall. Lorena De La Torre was 2-for-2 with a triple, two runs and an RBI for Rancho. Mia Elicerio was 3-for-4 with a double, two runs and three RBIs, and Giselle Ramirez went 3-for-4 with a double, two runs and two RBIs for the Rams. Kaitlyn Horstdaniel was 3-for-4 with two doubles and an RBI for the Wildcats. Arbor View 13, Faith Lutheran 1 — At Faith Lutheran, Trinity Brandon was 3-for-4 with three home runs and four RBIs to lead the Aggies by the Crusaders in five innings. Roxanne Ines was 1-for-3 with two runs for Arbor View. Kalsey Kekahuna-Lopes was 3-for-3 with a double and a run for Faith Lutheran. Centennial 14, Bonanza 0 — At Bonanza, Deanna Barrera went 4-for-4 with two home runs, two doubles and eight RBIs as the Bulldogs routed the Bengals in five innings. Ashlynn Heck was 3-for-4 with a double and an RBI, and Abby Hanley went 3-for-4 with four runs for Centennial. Winning pitcher Amanda Sink tossed a one-hitter and struck out six. Shadow Ridge 16, Eldorado 0 — At Eldorado, Alyssa Stanley spun a three-inning perfect game and struck out eight to lead the Mustangs by the Sundevils. Alexis Toia was 3-for-3 with a home run, a double and five RBIs for Shadow Ridge. Stanley went 2-for-3 with a home run and three RBIs, and Caitlin Covington was 2-for-3 with a home run, a double and two RBIs for Shadow Ridge, which also got a home run from Shea Clements. Palo Verde 17, Cheyenne 1 — At Cheyenne, Alyssa Lybbert went 2-for-3 with four RBIs as the Panthers rolled past the Desert Shields in four innings. Jadyn Navarro and Eliana Watson combined on a three-hitter for Palo Verde. Mojave 16, Western 1 — At Mojave, Britnee Holman was 2-for-3 with a double, three runs and six RBIs as the Rattlers routed the Warriors in three innings. Ysabella Morales was 2-for-2 with three runs, and Marianna Grayer went 1-for-2 with a triple and two RBIs for Mojave. Ta’Nyia Zeno and Hayli Greenberg combined on a no-hitter for the Rattlers. Green Valley 15, SLAM Academy 0 — At Green Valley, Cindy Martinez-Escamilla went 2-for-2 with a double, two runs and two RBIs to help the Gators rout the Bulls in three innings. Hannah Mearideth was 1-for-2 with a double and three RBIs, and Ava Mearideth went 1-for-1 with a double and two RBIs for Green Valley. Hailey Wood was 1-for-1 with two RBIs for the Gators, who scored 11 runs in the first inning. Cimarron-Memorial 19, Canyon Springs 0 — At Canyon Springs, Mya’Liah Bethea went 2-for-4 with two doubles, three runs and two RBIs as the Spartans routed the Pioneers in three innings. Angie Chin and Jordyn Ramos each went 2-for-4 with three RBIs, and Tiarra Del Rosario and Alexis Mello each went 2-for-3 with three runs for Cimarron. Destiney Guerrero tossed a one-hitter and struck out two for the Spartans. Legacy 19, Desert Pines 0 — At Mike Miller Park, Kiani Tung hit a grand slam as the Longhorns rolled past the Jaguars in three innings. Destinee Jefferson tossed a three-inning no-hitter, and teammate Sammantha Cisneros went 2-for-2 with two RBIs for Legacy. Pahrump Valley 28, Valley 5 — At Pahrump, Jacquellen Stobbe was 3-for-4 with a home run, a double, three RBIs and three runs scored as the Trojans took down the Vikings in three innings. Natalie Waugh-Magana was 3-for-3 with a double and four RBIs for Pahrump. Lincoln County 7-7, Calvary Chapel 0-0 — The Lynx won twice by forfeit over the Lions.